I was happy today. I didn’t feel giddily gleeful, just a quiet peace that came from knowing I was where I was supposed to be. I’d been walking in the desert, ruminating over my petty concerns. I have no major problems at the moment — I have a place to stay and food to eat, and I feel no great lingering sorrow over the death of my life mate/soul mate — but there are small matters that niggle at me. I seem to have crossed some invisible line where I no longer attract people through my words, but am actually starting to repel them — people have been blocking me on Facebook, and often it’s because of a simple non-combative comment I made in one of my discussion groups. I also wonder how to entice people to read my books, and I still ponder the whole issue of my writing. Although I am coming to an accommodation with continuing to write despite lackluster sales, I still am not comfortable with the idea of being a writer among millions of other writers — never have liked being a face in the crowd. So there I was, walking, thinking, talking a bit to my deceased mate, when it suddenly dawned on me that at that very moment, I was not a face in the crowd. There was no crowd — just me. I stopped and looked around. 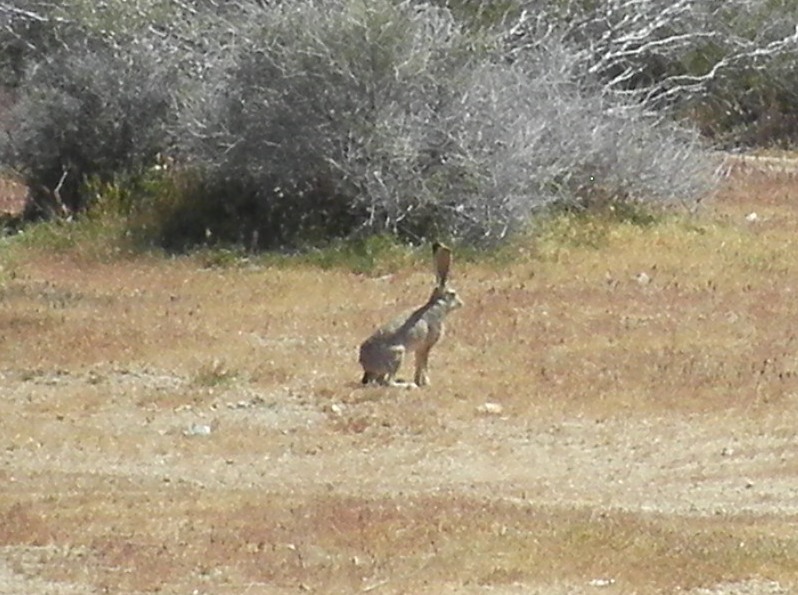 A jackrabbit loped by, but other than that, no creature made itself known. I felt the breeze cooling my sweat, heard the air whistling faintly as it passed my ears. I stilled my thoughts and simply stood there in the middle of the desert, deep blue skies above, sun-warmed soil beneath the soles of my shoes, desert knolls surrounding me and blocking any view of the nearby city. A friend who has endured far worse grief than I have, told me that she is finding peace by telling herself that she is happy. Alone out there in the desert, I decided I was finally ready to take the next step in going on with my life, so I thought, “I am happy.” And I realized that was the truth of it. Right then, I was happy. I had no sense of longing for something or someone, no sense of waiting. My entire life — all the joys and pains, the learning and creating, the loves and losses — had led to that very moment, and I felt as if I had arrived where I was supposed to be. There was no reason for me to be there, nothing to for me to do, no task to accomplish. All I had to do was simply . . . be. I’ve always believed, but don’t always remember to use, that the simple act of affirming something helps to make it real. Anything you can say by prefacing the words, “I am….” will be so. I’m so glad to know you’re finding peace in life at last. It’s wonderful to know you’ve come through the tidal wave of grief in one piece. Your piece made me smile as I read it. Thank you for sharing it with us. Thank you, Wanda. The state of being happy stunned me, but there it was. Didn’t expect to feel like that any time soon. This grief work was harder than anything I’ve ever had to do. The recognition of such moments is an encouragement. Life has its mountaintop and valley experiences, but much of it is spent on the level plain, and I always think it’s pleasant to be able to feel the ‘everyday-ness’ there… the contentment that all is well. I pray there will be many more of these happy moments for you in the coming days. The “small matters that niggle” will likely sort themselves out in due time. Nothing ever seems to progress on an even uphill graph… always there are dips in our progress. I don’t believe we can control how others act or respond, only how we do, so when it comes to book sales and facebook friends, just continue to be yourself, the best way you know how, and let it be enough. « Is it Better to Write for Yourself or to Write for Readers?